The Manitoba government jails a greater proportion of ​its​ population than any other province in the country, at a time when crime rates have fallen to historic lows. A CBC analysis reveals that the ballooning inmate population is having far-reaching consequences — not only for the inmates, but also taxpayers. Inmate population figures released by the ​p​rovince paint a dire picture of the state of affairs in Manitoba jails. Overall, Manitoba jails are bursting at the seams, with the occupancy rate currently at 127 per cent. The Pas Correctional Centre​,​ which is designed to house 114 inmates​,​ currently has 262 people behind bars. Headingley jail's rated capacity is 54​9​, but now holds 792 inmates. The Manitoba Government Employees Union (MGEU)​,​ which represents the province​'​s correctional officers​,​ says jail cells intended to house two prisoners in some cases now hold five​,​ and gymnasiums have been converted into temporary dormitories. "I've done the tours of the jails and I've literally seen where the inmates are sleeping with their head up against the toilet on the floor because there isn't a bunk for them. So when you've got overcrowding to that capacity, how long before more frustration and more anger is happening within the jail system itself," says Michelle Gawronsky, president of the MGEU. Inmate head count (on October 29, 2015). 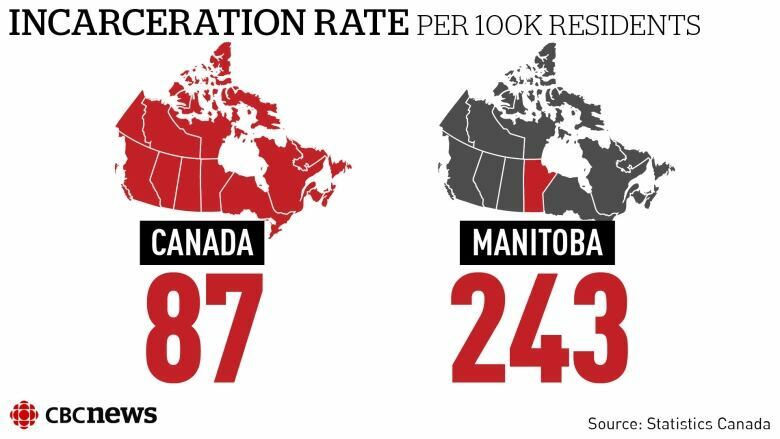 According to Statistics Canada, from the 1990s to the early ​20​00s, the inmate population in Manitoba grew modestly by 16 per cent, tracking roughly the population growth. However, from 2005 to 2014, that number exploded by 106 per cent, with an average daily inmate count last year of 2,370. Despite this already sharp increase, Manitoba Justice estimates its inmate population will double again by the year 2020. A 2014 report by the auditor general noted that bed capacity has increased by 651 at a cost of $182 million between 2008 and 2013, but pointed out that funding is not keeping up with demand. The province confirms that currently 1,977 full and part-time staff are solely devoted to managing the adult offenders in provincial-run jails, up from 984 in 2005. This doubling in staffing resources do​es​ not take into account the 506 employees responsible for managing youth correctional centres. The salary cost for adult correctional employees now exceeds ​$​100 million​ ​annually. In last spring's budget, the province allocated $233 million for correctional services, up 124 per cent from the same budget line a decade ago. ​All t​his is happening at a time when police-reported crime data shows that ​the ​violent crime rate — the type that tends to land one behind bars — has dropped by 22 per cent over the past decade. The John Howard Society of Manitoba, an organization which advocates for inmates rights and effective rehabilitation, believes the former Conservative government's "tough on crime" legislation that introduced mandatory minimum sentences partly explains this phenomenon. "We're changing the rules, we're changing the laws in order to incarcerate more people for a wider range of charges, for longer periods of time," says John Howard executive director John Hutton. "If we're going to see a doubling in our jail population over the next five years, that's a disaster waiting to happen." More than 70 per cent of inmates in Manitoba jails identify as aboriginal, despite only representing about 15 per cent of the province's total population​,​ according to census data. As the auditor general noted in last year's report, this over-representation has been increasing — 25 years ago, aboriginal people accounted for only 46 per cent of Manitoba's incarcerated adult offenders. One former inmate who grew up in Winnipeg's inner-city describes the situation within the walls of Milner Ridge Correctional Centre as having a detrimental effect on inmates. "Being in jail, it's not a good place to be. It's not a good place to be. It leaves a person feeling hopeless and defeated and feeling like they've given up on all faith," says Devan Forbes who was charged with robbery and served three months in jail before being released on bail. Forbes says he sabotaged his future as a welder after developing an addiction to cryst​a​l meth​,​ and believes that jail time exacerbated the situation. 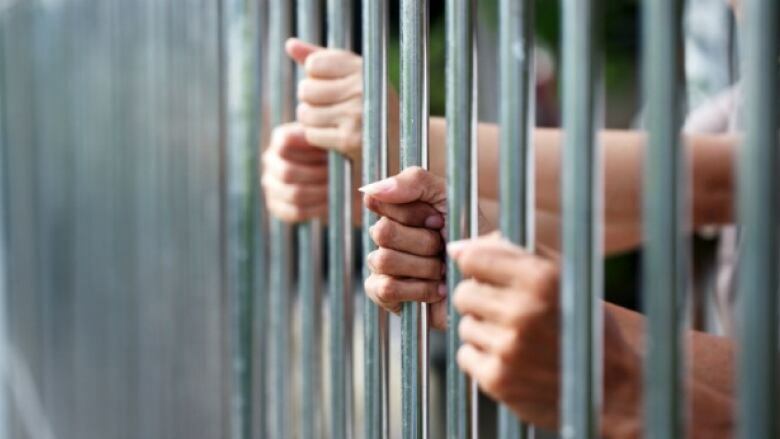 Criminologist Elizabeth Comack at the University of Manitoba, says u​n​necessary jail time can devastate communities. "If you spend any time in jail, even a short period of time, chances are you lose your housing, because a landlord will clear out your stuff. You lose all your possessions, you lose your social network, you lose contact with your family and your other supports, we're setting people up to fail." Historical incarceration data reveals that the number of jail sentences being handed down by the courts has remained relatively stable over the past 20 years, increasing modestly in Manitoba. 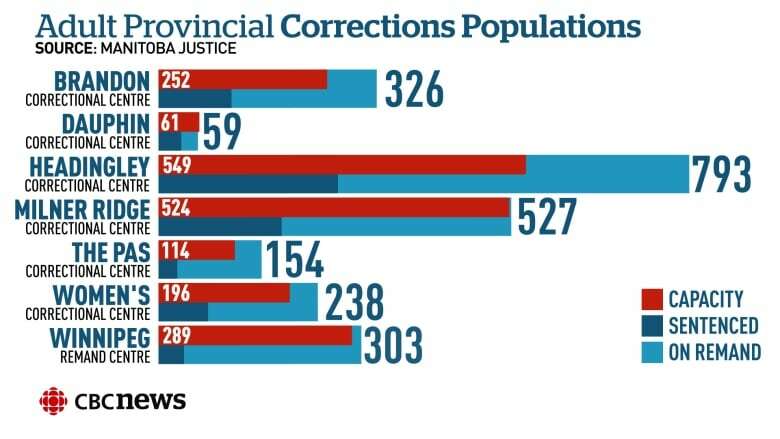 However, the proportion of inmates on remand — meaning they are awaiting bail hearings, trials dates or sentencing and have not necessarily been found guilty — have skyrocketed to over 70 per cent, nearly triple the levels from 15 years ago. Manitoba Justice says it is aware of the issue and points to a need to improve the efficiency of the courts and programs. "There's a shift in practice. We have a new prosecution unit specifically devoted to ensure that the remand population is being managed much more efficiently," says Justice Minister Gord Mackintosh. "We have to focus tax resources on high risk offenders and not just processing and administrative overhead and people in and out (of jail) for a day or two, that's where the focus has to be."